ROSELAND, N.J., Jan. 23, 2019 /PRNewswire/ -- Wages for U.S. workers grew 3.4 percent over the last year, increasing the average wage level by $0.93 to $28.06 an hour, according to the ADP Research Institute® Workforce Vitality Report (WVR) released today. The growth, steadying at 3.4 percent annual as of December 2018, was driven by strong wage gains for workers in the education and health services industry, representing 19 percent of the workforce, (4.1 percent wage growth, $27.05 average hourly wage) and trade, representing 22 percent of the workforce, (4.4 percent wage growth, $24.56 average hourly wage). The Northeast (3.7 percent, $31.57) and large businesses (4.9 percent, $29.04) also contributed. Employees in the resources and mining industry saw their wages decrease (-0.2 percent, $35.24) and businesses with less than 50 employees experienced the slowest wage growth (2.0 percent, $26.06). "As the labor market sits at full employment, we continue to see an overall slowdown in job switching across the majority of industries," said Ahu Yildirmaz, co-head of the ADP Research Institute. 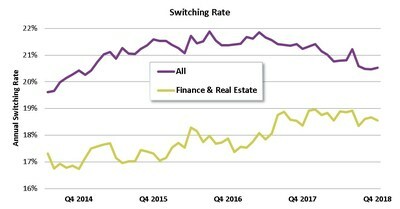 "One industry defying the market trend is finance, which has experienced a steady uptick in job switching. This acceleration is driven primarily by younger workers." Among industries, as expected, information continued to lead the way for both wage level and wage growth. In addition to the top overall wage growth number of 5.1 percent, those who successfully switched positions to the information industry had wage growth of 10.6 percent. Employment in the information industry jumped by 2.9 percent. Job switchers in professional and business services and construction also realized high wage growth of 8.2 and 9.0 percent, respectively. In trade, the largest sector, job holders experienced stronger growth in wages than the workers who switched to the industry, 5.3 percent versus 3.8 percent. Workers in the West and Northeast outpaced other two regions with 3.7 percent wage growth but West had the highest employment growth at 2.7 percent. Job switchers also fared best in the West experiencing a wage growth of 7.7 percent. Workers in the South had the lowest wage growth at 3.0 percent and Midwest had the worst employment growth at 0.9 percent. By firm size, workers at large firms had the highest wage growth rate at 4.9 percent, with employment growth at 2.4 percent. The WVR also revealed that 20.5 percent of U.S. employees successfully switched firms in the last year. This highlights an overall slowdown in job switching. However, job switching in the finance industry is accelerating, where more than 18.6 percent of workers in the industry switched firms in the last year. We have seen wage growth for all job switchers gradually accelerating during this same time period, currently at 5.4 percent. In finance, wage growth for job switchers is also picking up, currently at 6.3 percent. The ADP Workforce Vitality Report (WVR) was developed by the ADP Research Institute (ADPRI). It is an unprecedented, in-depth monthly analysis (published quarterly) of the vitality of the U.S. labor market based on actual data that identifies labor market trends and dynamics across multiple dimensions. These dimensions include employment growth, job switching, wage growth and hours worked. In addition to the macro data presented in the report, there are also segment-specific findings by industry, state, gender, age, experience, and pay level. Established in October 2014, the report methodology was updated in April 2018 utilizing monthly data to include additional data points and deeper insights. For more information about the report, please visit http://workforcereport.adp.com/.